Sunya – The Magic and Wonder of Math and Science Adding & Subtracting: a T.O.S. Review | My Journeys Through Life . . . Herding Cats In New Mexico! 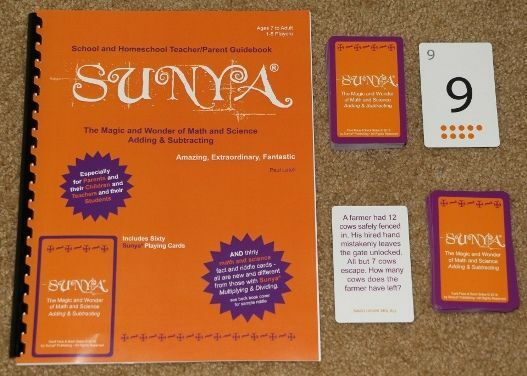 The boys and I have been having fun with a new educational game called Sunya – The Magic and Wonder of Math and Science Adding & Subtracting, from Sunya Publishing. This new game is intended for ages 7 and up, and that really means “and up!” I enjoy playing it right along with them! As you can see, I chose to keep the cards separated into two different lunch size zip baggies. Sunya, according to the instruction book, is a word from Sanskrit, which is the ancient, classical language of the Hindus. The word means empty or void of any quantity. In this game, the player who goes out first by playing his last card in making a number sentence is the winner, and says Sunya. To be honest, the instruction book was somewhat confusing for a little while. I finally decided that in an effort to cover all possible playing ideas, the writers made it more complicated than necessary. We sort of figured out what we were doing as we played, and at one point, discovered we had already gone beyond the basic game. In the basic game, the idea is for each player to draw a card to add to his or her hand, and if they have the needed cards, they may play on top of the existing number sentence for example, 5 + 4 = 9. A player could, if he or she had the cards, place a 4 over the 5, and an 8 over the 9, changing the number sentence to 4 + 4 = 8. That would be the basic beginner game. There is also a minus sign so that you can work on subtraction if you want to. When I say I think we went further than we were supposed to, that would be because we began using digits that equaled a double-digit answer. At that point, we had two card piles in the answer spot, giving us even more options. That was even more fun for us! The player who plays all of his cards first and says Sunya is the winner, and draws a card from the riddles and facts card and then he or she gets to ask the other players the riddle and see if they can answer it. As I said above, this is a brand new game. Our instruction book was printed for the most part in black and grey scale, with two pages in color. we were asked to let Sunya know which we preferred, and in my family, we liked the color much better. One other thing I would do differently would be to have either a different color, or a different pattern on the backsides of the number cards and the riddle cards, so we would remember which is which when they are face down on the table. All in all, we are enjoying this game. It can be played at home, and it is portable, so we can also take it with us when we have to be out of the house for appointments and the like. The only changes I’d make have already been discussed above in this review, but we would encourage this as a good game for fun math practice. Sunya also is producing the game Sunya – The Magic and Wonder of Math and Science Multiplying & Dividing, which a number of other crew members have been reviewing. To see the honest reviews of 99 other crew members, please click on the banner below.